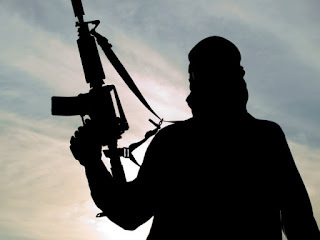 A suspected armed robber, Samson Omokinovo who is cooling off his heels at the Ebrumede Police Divisional Headquarters in Uvwie Local Government Area of Delta State Nigeria allegedly gave four hundred naira to one Mrs. Erhire Egbagbadia after himself and two others allegedly robbed her of Fifty-eight Thousand Naira along the East-West Road near DSC roundabout, DAILY POST reports. Contacted, the Divisional Police Officer, Ebrumede Division, CSP Ibrahim Shaibu declined comments on the matter but police source who craved anonymity stated that the suspect was arrested following the alarm raised by the victim at the DSC roundabout, pointing out that the incident occurred on Saturday, July 22. The Police stated that the suspect and two others now at large in a tricycle blocked their victim, Mrs. Mrs Egbagbadia where she parked her vehicle, assaulted and robbed her of the sum of Fifty-eight Thousand Naira. The police noted that the suspect has confessed to the crime and he has provided useful information that will lead to the arrest of the other two now at large. door while the two others blocked the driver’s side demanding for money. Mrs. Egbagbadia also claimed that one of the suspects gave her a dirty slap for questioning them before asking the other to show her the gun. According to Mrs Egbagbadia, “That was when it was done on me that they were armed robbers,” adding that they searched her bag, car and collected N58,000. and asked her to buy fuel with it. Egbagbadia noted that she raised the alarm which attracted a patrol team from Ebrumede Division who were on routine patrol around the area while the suspected thieves were few distance from her. The Police quickly gave the suspected armed robbers a hot chase which led to the arrest of Samson Omokinovo. The Delta State Acting Police Public Relations Officer, DSP Andrew Aniamaka did not pick nor return calls or respond to text messages sent to his mobile phone.